This week, CJ and Jordan discuss CJ’s long-awaited return to the court as the Blazers get ready for the postseason. What’s it like to prepare for the playoffs? Is the preparation focused on individual matchups or teams? How vital are video staffs to team’s prep? The guys tackle these questions and more. Plus, reaction to the Kyle Korver article and the discussions it sparked in the locker room; thoughts on Magic Johnson’s resignation in LA; and an homage to Dwyane Wade and Dirk Nowitzki as they play their final games in the league. Welcome to this week’s Pull Up Pod – NUMBER 52 – shout out to CC Sabathia.&nbsp;This week, CJ and Jordan take a deep dive into the game-within-a-game in the NBA. Who is the toughest cover in the league? How do you adjust your game to see things before they develop? What’s it like to defend against a team like Golden State? Which players are the most creative with the ball in their hands? CJ answers these questions and much more.&nbsp;&nbsp;Plus, some predictions for the Final Four, an update on the Blazers recent run and a return to Wine Corner.&nbsp;PULL UP. Welcome to this week’s Pull Up Pod – NUMBER 51 – shout out to Metta World Peace. This week, CJ and Jordan are joined by Tennessee star Grant Williams before the Volunteers Sweet 16 showdown with Purdue. Williams – the SEC Player of the Year for the second consecutive year – talks in depth about the team and their close bond as they aim to continue their postseason run. He also discusses choosing Tennessee, his adjustment from high school to the college game and his many talents and interests off the court. Plus, CJ and Jordan talk Zion, Ja Morant and more from March Madness, send their best to Jusuf Nurkić after his injury and weigh in on some NFL news. PULL UP. Welcome to this week's Pull Up Pod--NUMBER 50--shout out to The Admiral, David Robinson.&nbsp;<br><br>This week, CJ and Jordan were joined by UCF's 7'6 big man, Tacko Fall. Tacko talked in depth about coming to America to learn how to ball, what it meant to have his mother there for Senior Night, and UCF's mission statement for this year's Tourney.&nbsp;<br><br>Also, CJ provided Tacko with some advice and remembered the epic Lehigh-Duke upset, before making some March Madness predictions.&nbsp;<br><br>Plus, a quick update on CJ's knee and how things are progressing.<br><br>PULL UP. Welcome to episode 49 of Pull Up. On today's show., CJ celebrates some of the Browns' new acquisitions, before he and Jordan talk to legendary Michigan State coach, Tom Izzo. Coach Izzo talked to the guys about...<br><br>- Compensating college players<br>- What it takes to get his team ready for a March Madness run each year<br>- Keeping in touch with his former players<br>- Coaching in the NBA and why he's stayed in the NCAA<br><br>...and much more. Coach Izzo and CJ even reminisced about CJ almost pulling off an upset of Michigan State with Lehigh, back in the day.<br><br>PULL UP. Welcome to another episode of Pull Up--number 48!<br><br>On today's show, CJ and Jordan are talking about:<br><br>- LeBron. Is this the most backlash he's faced from a home crowd? Could the state of the Lakers deter Anthony Davis from wanting to play there?<br><br>- The Blazers' road trip.<br><br>- Antonio Brown's landing spot.<br><br>- And most importantly, mental health. The guys take a long look at the state of mental health around the league, and the impact that social media has on mood, self esteem, and overall happiness, Plus, what needs to be done to help players who are struggling to get help for themselves? This conversation was both insightful and useful, and stemmed from Adam Silver's recent talk with Bill Simmons at MIT's Sloan Sports Analytics Conference.&nbsp;<br><br>PULL UP. In honor of the start of Spring Training...welcome to the Tom Glavine episode of Pull Up--number 47!<br><br>On this week's show, CJ and Jordan talk...<br><br><br>- CJ getting his number retired at Lehigh&nbsp;<br><br>- Nurk vs. Simmons<br><br>- Enes Kanter and Rodney Hood adjusting to the Blazers<br><br>- And whether or not kids would benefit from playing in Europe until they're NBA eligible<br><br><br>Also, the guys talk player-ref relationships, LeBron's Lakers, and CJ's role within the NBAPA.<br><br>PULL UP! Welcome to the 45th episode of Pull Up. This week, CJ and Jordan assess the trade deadline, now that the dust has settled. Who got better? Why didn't the Pelicans trade AD? Is it hard to go to practice after knowing that your current team tried really hard to trade you, but couldn't?<br><br>Also, the guys talk through this year's MVP race, Bradley Beal's non-travel, and MJ's reaction to milestones by James Harden and Russell Westbrook.<br><br>Plus, a few of your questions from Twitter and Instagram, and CJ's Wine Corner.<br><br>PULL UP. On this week's show...<br><br>We had on three-time NBA champ and 2017 Defensive Player of the Year, Draymond Green. Draymond talked about being fueled by doubt, the role luck has played in Golden State's success, the upcoming trade deadline, and why Boogie Cousins is so misunderstood.<br><br>He also elaborated on his Rudy Gobert All-Star tweet, and talked about the possibility that Golden State's roster sees significant changes after this upcoming summer...<br><br>...PULL UP. On this week's show...<br><br>CJ is fresh off his first ever triple-double and talks about the entire experience. Also, the guys break down the AD situation--why does he want to be traded now? Is LA the best landing place? Plus, Vince Carter has strong feelings about ring chasing,, CJ talks about the importance of keeping your circle tight and knowing when to say no, and Jordan briefly weighs in on his family's big week.<br><br>PULL UP. On this week's show, number 42--shout out to Jackie Robinson--CJ and Jordan catch up on all things NBA, including...<br><br>- Dame and Nurkic getting into it with Russ Westbrook<br><br>- Devin Booker getting into it with Gorgui Dieng.<br><br>- The NBA trade deadline, and the ways in which trade rumors, and eventual trades, impact players.<br><br>...and much more.<br><br>Plus, the guys talk about the brutal calls in the NFL's Conference Championship games, Mahomes not getting the ball in overtime, and Todd Gurley's usage in the Super Bowl.<br><br>PULL UP! Welcome to episode 41 of Pull Up--shout out to Dirk Nowitzki. On this week's show, CJ and Jordan talk to former Duke legend and Chicago Bull, Jay Williams. Jay was ready for an interview full of Duke-Lehigh jokes, but instead the guys talked about the current state of basketball--Zion and Duke, James Harden's monster year, and which team Jay would want to play on in today's NBA. Plus, thoughts on Kyler Murray's decision, Jay's relationship with Coach K., and the best trash talkers from Jay and CJ's respective eras. Let's go, it's time to PULL UP. Jimmy Butler's Retirement Timeline, Thoughts on T-Wolves Next Coach, the Importance of Diet at This Point in the Season, and Would CJ Ever Coach? Happy New Year! To kick off 2019, CJ and Jordan are joined by another Long Island native, who's having a great season out in LA--Tobias Harris. Tobias talked about advice he got from Stan Van Gundy that changed his game, offseason preparation, minimizing social media use, and how Channing Frye, his cousin, helped keep the young players loose when they played together in Orlando. Plus, CJ and Jordan make predictions for the College Football National Championship game and the NFL playoffs. Let's go, it's time to... PULL UP! 'Twas the night before Christmas...so why not drop a fresh episode of Pull Up?! This week, CJ and Jordan are joined by a man who's playing in his first season with the Eastern Conference-leading Toronto Raptors, Danny Green. Danny talked about getting traded with Kawhi this past offseason, what playing in Toronto has been like, and how it's differed from his time in San Antonio. DG also weighed in on how he's shooting this season, the NBA's top shooting guards, and the toughest players in the league to play D against. Let's go, it's time to... PULL UP! Welcome to another edition of Pull Up, the Shaun Alexander episode. This week, CJ is joined, friend and former teammate Earl Watson. Earl spoke about being a big brother to CJ the younger guys on the Blazers when they player together and what CJ learned from Earl and the wisdom he imparts on the rookies and bench players. Let's go, it's time to... PULL UP! Oh, and don't forget: Answer the trivia question from today's show on the Pull Up Twitter feed (reply under the pinned tweet) for a chance to win some CJ Li Ning gear. Good luck! Welcome to another edition of Pull Up, the Marcus Smart episode, to be exact. This week, CJ is joined, in person, by Blazers teammate, and former Buckeye, Evan Turner. Evan spoke about his childhood in Chicago and evolving into the player he is today, the conversations he had with CJ prior to signing in Portland, breaking his back, and his love for Ohio State University. Also, ET weighed in on the best Christmas song of all-time, his love of art, and whether or not man has ever set foot on the moon. Let's go, it's time to... PULL UP! Oh, and don't forget: Answer the trivia question from today's show on the Pull Up Twitter feed (reply under the pinned tweet) for a chance to win some CJ Li Ning gear. Good luck! On this week's show, CJ and and Jordan are talking:NBA player superstitions, and where CJ would draw the line.Bumpy plane rides, and traveling as an NBA playerHezonja's step-over--would CJ have done the same?Impressive rookies that CJ's played against this year Also, a handful of your Twitter questions, CJ's Wine Corner, and Dennis Smith's reaction to losing his teeth. Let's go, it's time to... PULL UP. After a one week hiatus, for Thanksgiving, CJ and Jordan are back and have a lot to catch up on. Markelle Fultz's season gets stranger by the day, Hue Jackson had an eventful Sunday, and which teams would benefit from adding JR Smith to their squad? Plus, a new Wine Corner and CJ breaks down his finger tip dunk from last week's game at MSG. Let's go, it's time to... PULL UP. This past weekend in the NBA was a big one so, naturally, this week's Pull Up is a big one as well. CJ and Jordan talk through the Jimmy Butler trade--is Philly the team to beat in the East? Also, the guys touch on Tyson Chandler's instant impact in LA and the Carmelo situation in Houston--where could he land next? Plus, CJ debuts a new segment called "Play Breakdowns," and celebrates the Browns' third win of the season. Also, Common joins the show, talking about his relationship with Kanye, the time he spent around Michael Jordan as a kid, his career as an actor, and about the importance of investing in mental health. Let's go, it's time to... PULL UP. Welcome back, once again, to another episode of Pull Up. This week, CJ and Jordan were joined by one of the best trash talkers, and one of the biggest Knick fans, in the game, Michael Rapaport. Rap had a few questions for CJ, off the jump, about life in the NBA, before commenting on this Summer's KD interview and challenging the guys to play him in fantasy football. He also touched on rooting for New York teams, what his Knicks need to do to reach the next level, and what it was like to spend some time with Tupac, back in the day. Also, CJ and Jordan talked teams that have surprised them around the NBA thus far, Le'Veon Bell's cryptic tweet, and Omri Casspi's wild Shammgod. Let's go, it's time to... PULL UP. Happy Halloween! Well, this episode of Pull Up was recorded on Halloween, at least, and featured the pride of The BX, UConn legend, and Charlotte Hornet star Kemba Walker. Kemba talked CJ and Jordan through UConn's 2011 title run and his mindset during that time, when it was obvious to the world that he was ready for the NBA. He also spoke on what it's going to take for the Hornets to be consistent and successful, how he trained during an offseason where he was fully healthy, and the profound impact that Tony Parker has had on the team, since coming over from San Antonio. Plus, CJ, Jordan, and Kemba talk a little Halloween, and we take you to the wine corner. Let's go, it's time to... PULL UP. This week's show is a day late, but it'll be worth the wait because CJ and Jordan got to spend some time with one of the most outspoken and charismatic men in all of sports, Stephen A. Smith. As you may imagine, Stephen A. had plenty to say about plenty...The 76ers and Markelle FultzThe teams that will make the playoffs from the Western ConferenceThe Darius Bazley SituationWhether he'd prefer Kevin Durant or Anthony Davis, over the next five years ...and much more. Prepare to be entertained, it's time to... PULL UP. NBA basketball is back! And before settling in to take in the first night of the season, CJ and Jordan caught up with second-year Jazz guard, Donovan Mitchell. Mitchell spoke about his rookie year in Utah, after being traded by the Nuggets, why he wears number 45, being compared to Dwyane Wade, and what he'd like to improve upon in year two. He also touched on how he would pick Kobe's brain, if he had the opportunity, and his connection to the New York Mets. Plus, CJ shares thoughts on some of this year's rookies, and on the recent passing of Blazers and Seahawks owner, Paul Allen. PULL UP. On this week's show... CJ and Jordan caught up with former NBA assist machine and newly minted Hall of Famer, Steve Nash. Nash and CJ shared stories about being undervalued and overlooked, and Steve emphasized the correlation between success and resilience before talking about his new app, HomeCourt, which uses mass amounts of data to make you a better basketball player. Also, CJ revealed that Steve was instrumental to his success during one of the most memorable games he's ever played. Let's go, it's time to ... PULL UP. NBA Players and Social Media, Training Camp Updates, LeBron's New Shows, and a Fan Q&A! On this week's show, CJ and Jordan talk...Blazers training camp and CJ's role on the teamSocial Media addictionLeBron's new showsNot being able to earn money as a college athlete ...and much more. Plus, a Twitter Q&amp;A and the return of CJ's Wine corner. Let's go, it's time to ... PULL UP. On this week's show... CJ and Jordan are joined by a former NBA veteran, and one of the realest dudes out there, Stephen Jackson. Stak gave his take on this year's Sixers and what teams are going to have to do if they want to beat the Warriors, before revealing what really went down with Andrew Wiggins, and what he thinks of the whole Jimmy Butler situation. Plus, Jackson told some amazing, eye-opening childhood stories and explained the impact that Stephon Marbury had on his career, when he arrived in New Jersey. Let's go, it's time to ... PULL UP. This week's show (number 25--the Nick Anderson edition of Pull Up) is a special one. It took place at the Portland Boys and Girls Club, where CJ was opening up the Dream Center, a room for kids to learn the ins and outs of media and journalism. And in front of a small audience, CJ and Jordan christened the Dream Center by interviewing another Blazers fan favorite, Damian Lillard. Lillard talked about a lot, from his recent workout video to Vontae Davis retiring mid-game, and his life as a new dad. Also, during a Q&amp;A, he spoke about NBA 2K ratings and what it really takes to make it as a D1 athlete. Let's go, it's time to ... PULL UP. On this week's show...CJ was in Cleveland for the Browns opener, and got to spend some time with Jarvis Landry.The guys talk about the Le'Veon Bell situation in Pittsburgh.Cj played one-on-one against his big bro.Jordan and CJ talk about the Serena Williams controversy--was Serena treated unfairly?And Andrew Bynum is attempting a comeback. Also, CJ and Jordan are doing a live podcast in Portland next week with a very special guest, and the Pull Up Pod has its own fantasy football league! Sign up to play against CJ and Jordan at FanDuel.com/PullUp. The game is free, with cash prizes for our listeners. If CJ wins, he'll be donating the money to charity. Let's go! it's time to... PULL UP. On this week's show... CJ and Jordan were joined by former Broncos, Jaguars, and Dolphins TE, Julius Thomas. Thomas, who just retired to pursue a PhD in psychology, spoke about his decision to stop playing football, his quest to learn more about CTE, and the steps that can be taken in order to make the NFL safer. He also spoke about Colin Kaepernick and Nike's decision to use him in their latest ad, before weighing in with thoughts on how CJ's Browns are going to do this season. Let's go! it's time to... PULL UP. On this week's show... CJ and Jordan were joined by Pelicans big man, Jahlil Okafor. Okafor, who already has four years in the league at the age of 22, spoke on his summer of transformation, the uncomfortable process of changing his shooting motion, and being excited to play with Anthony Davis. He also touched on Duke's young stars and their NBA comparisons, the advice he would offer to fellow Sixers lottery pick, Markelle Fultz, and why Kevin Love's Players' Tribune piece meant so much to him. Let's go! it's time to... PULL UP. On this week's show... CJ and Jordan take a look at the HBO series Hard Knocks, featuring CJ's Cleveland Browns. So far, during this year's camp, there's been fights, passionate speeches, trade requests, and a secret QB clubhouse--plenty to talk about. Also, on the field, what impact will Baker Mayfield have on this team? Plius, the guys answer some of your most pressing Twitter questions. Let's go! it's time to... PULL UP. On this week's show... CJ and Jordan are joined by Boston Celtics shooting guard, Jaylen Brown. Brown talked to the guys about entering the draft without an agent, being considered "too smart," the impact mediation has had on his life, and his desire to write a book. Also, Jaylen and CJ discuss NBA 2K ratings, Booray and plane gambling, Jaylen's free throws, and CJ's time as a karate master. Let's go! it's time to... PULL UP. On this week's show... CJ discusses his trip to China, and the now legendary KD podcasts, before talking with Jordan about Melo to the Rockets, Kawhi to the Raptors, and LeBron's new school. Eagles DE Michael Bennett also joined the show to talk about his book, the current state of the NFL--from National Anthem rules to CTE--and how much longer he plans on playing. Let's go! it's time to... PULL UP. Special thanks to this week's sponsor, Wolf and Shepherd. Get 10% off your first order by using the promo code PULLUP. On this week's show, CJ is joined, once again, by the one and only, Kevin Durant In Part Two of their interview, KD weighs in on his NBA Mount Rushmore, talks with CJ about what it was like playing college ball, and lists some of the league's toughest players to play against. Also, Kevin and CJ debate whether or not being a starter matters, and Jordan, who's still on vacation, has a question for KD about Golden State's continuous drive to win. Let's go! it's time to... PULL UP. Special thanks to this week's sponsor, Wolf and Shepherd. Get 10% off your first order by using the promo code PULLUP. On this week's show, CJ is joined by two-time NBA Champion and Finals MVP, Kevin Durant In Part One of their two-part interview, KD talks about his decision to sign with the Warriors and acclimating to a new life out west, navigating social media, his offseason routine, and how he reacted to the news that Golden State signed Boogie Cousins. Also, Kevin touches on his relationship with Russell Westbrook, and Jordan, who's on vacation, chimes in with a couple of questions. Let's go! it's time to... PULL UP. Special thanks to this week's sponsor, Wolf and Shepherd. Get 10% off your first order by using the promo code PULLUP. Summer League impressions, More Free Agency Talk and Where Does Melo Land? On this week's show, CJ and Jordan are joined by Sports Illustrated's Ben Golliver in Las Vegas for NBA Summer League. The guys give their take on what they have seen from some highly touted rookies. Trae Young's early struggles and Kevin Knox's quick success are among the topics covered by the guys. Plus, Boogie's impact in Golden State and where is the best destination for Carmelo Anthony? Let's go, it's time to... PULL UP! On this week's show, CJ and Jordan break down all of the NBA Free Agency moves, what they means for the rest of the league, Boogie Cousins mindset in joining the Golden State Warriors, LeBron's supporting cast in Los Angeles and who would win in a 7 game series: Lehigh or Duke. Let's go, it's time to... PULL UP! The NBA Awards, Draft Reactions, Free Agency, and a Bunch of Your Twitter Questions! On this week's show, CJ and Jordan recap the draft, from the players headed to Portland and Michael Porter's draft stock, to how Trae Young will fit in Atlanta. Also, the guys talk about the NBA Awards (was Simmons the right choice for ROY? How about Harden for MVP?) and free agency, before answering a bunch of your Twitter questions. Let's go, it's time to... PULL UP! On this week's show, CJ and Jordan are getting ready for the NBA Draft--talking Mikal Bridges, Mo Bamba, DeAndre Ayton, and some of the other college standouts whose lives are about to change in a big way, this Thursday. Also, CJ remembers, in detail, his own draft experience, from the workouts to signing a shoe deal, and everything in between. Let's go, it's time to... PULL UP! Special thanks to this week's sponsor, LinkedIn ($50 credit toward your first job post). On this week's show... CJ and Jordan put a cap on this year’s NBA Finals—LeBron losing his cool, KD’s greatness, and where both teams go from here. Where does LeBron play next year? Does Draymond get a Super Max deal? Also, some early news, notes, thoughts, and wisdom about the NBA Draft, and life as a young player. Let's go, it's time to... PULL UP! Billions Creator Brian Koppelman, the NBA Finals, and Where Will LeBron Land This Offseason? On this week's show, CJ is in Turkey visiting big bro, Errick McCollum. CJ, Errick, and Jordan spoke a bit about Errick's career and the influence he had on CJ growing up, before covering what's been an all around WILD week. First, we've got the Cavs and Warriors, again. What does LeBron's supporting cast have to accomplish in order to give Cleveland a shot in this series? Also, we covered Pusha T vs. Drake. Did things get too personal? And finally a few thoughts and comments on Bryan Colangelo's alleged Twitter accounts. Let's go, it's time to... PULL UP! Predicting the Rest of Cavs-Celtics, What the Suns Should do with the First Overall Pick, and Which Warrior Would You Build Around? On this week's show, CJ and Jordan take a look at the Cavs-Celtics series, and give their thoughts on which team is going to the Finals. Also, CJ talks about the toughest defender he's gone up against and covers his offseason workout plan, before debating with Jordan about what the Suns should do with the first overall pick in the draft. Plus, James Harden's defensive issues, CJ recommends a new wine, and a fan question about which Golden State star to build around. Let's go, it's time to... PULL UP! Special thanks to this week's sponsors, Travel Portland and SeatGeek. Get $20 off your first ticket purchase by using the promo code PULLUP. On this week's show, CJ and Jordan are joined by Pistons Center Andre Drummond, who talks about his offseason training, shooting more threes, and his rap career, before answering a bunch of rapid-fire questions. Also, the Rockets are already having a tough time with the Warriors, how legal gambling could impact the NBA, and what would it take for KD to enter the GOAT discussion? Let's go, it's time to... PULL UP! Follow CJ @CJMcCollum on FB/Twitter and @3jmccollum on Instagram. Follow Jordan @Schultz_Report on Twitter and Insta. LeBron is on a Wild Run, Thinking About Childish Gambino's "This is America," and What's Next for Raptors? On this week's show, CJ and Jordan have a ton to cover. This one could have been a double episode. We talk Rockets-Warriors, the Met Gala, Childish Gambino's new video, Rodney Hood and David Fizdale rumors, next steps for the Raptors, and whether or not LeBron is currently playing the best ball of his career. Plus, CJ's weekly Wine Corner and the debut of his "J. Cole Quote of the Week." Drop what you're doing, it's time to... PULL UP! Follow CJ @CJMcCollum on FB/Twitter and @3jmccollum on Instagram. Follow Jordan @Schultz_Report on Twitter and Insta. Special thanks to this week's sponsors, Travel Portland and SeatGeek. Get $20 off your first ticket purchase by using the promo code PULLUP. James Harden is a Monster, Horford is Underappreciated, Lance vs. LeBron, and Will Baker Mayfield Thrive in Cleveland? On this week's show, CJ and Jordan talk LeBron vs. Lance, Russ' interactions with Jazz fans, Al Horford being underappreciated, and Terry Rozier's Drew Bledsoe jersey. Also, Jordan tries to get CJ to compare himself to James Harden, we play a new game called "Bet or No Way," and the Browns drafted Baker Mayfield! Was that the right pick? We've got a lot to cover... PULL UP! Follow CJ @CJMcCollum on FB/Twitter and @3jmccollum on Instagram. Follow Jordan @Schultz_Report on Twitter and Insta. Special thanks to this week's sponsor, Travel Portland. 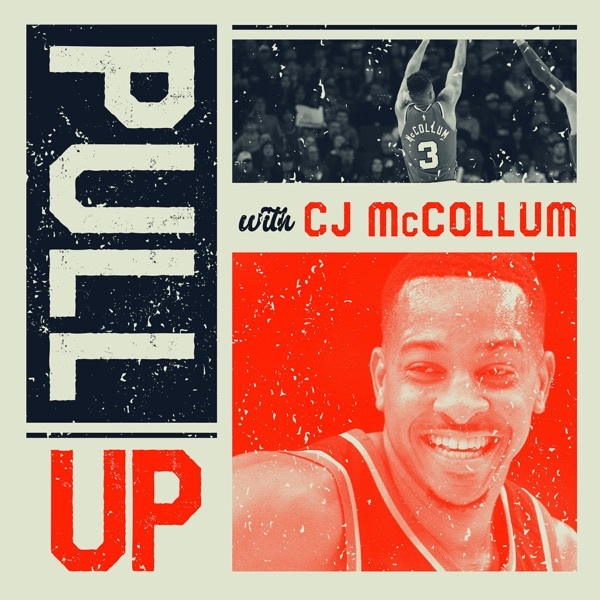 In this episode of Pull Up, CJ McCollum recaps the Blazers tough Game One loss and explains how he and his teammates plan to turn it around for the remainder of the series. Then Jordan Schultz and CJ run through other compelling storylines across both conferences, including: -How Victor Oladipo re-invented himself -The 76ers threat to go deep in the postseason -How Rajon Rondo and Jrue Holiday are difficult to match up against We want to thank our sponsor this week, Away Travel. Subscribe to the show on Apple Podcasts or wherever you get your shows. Please rate and review the show (it helps us get the word out)! Follow us on FB/Twitter/Insta @PullUpPod. Follow CJ @CJMcCollum on FB/Twitter and @3jmccollum on Instagram. Follow Jordan @Schultz_Report on Twitter and Insta. PULL UP!!! In this week's episode of Pull Up, Miami Heat star Dwyane Wade joins CJ and Jordan. First, CJ reflects on the crazy push for the playoffs in both conferences (0:30) and the tough stretch that the Blazers have faced, and the guys talk Ben Simmons and the 76ers (4:00) in the playoffs. Then they try to decipher the latest with Kawhi (8:00) and how CJ relates to going through a difficult injury. Then, D-Wade joins to discuss a whole variety of topics, including his time with LeBron and the Cavs this season, whether LeBron is better now than he was with Miami, the differences between playing ball in the social media age and in previous generations, the responsibility of athletes to speak out, mental health and the value of seeking therapy, the lack of African-American front office members in the NBA, LaVar Ball, the future of marijuana in the NBA, where key free agents will go, and so much more. Follow the show at @PullUpPod on FB, Insta and Twitter. Send us questions and CJ and Jordan will answer the best ones on the show. Follow CJ @CJMcCollum on FB/Twitter and @3jmccollum on Instagram. Follow Jordan @Schultz_Report on Twitter and Insta. We're grateful to our sponsors this week, Audible and SeatGeek. Please subscribe to the show and leave a rating and review for us. It helps spread the word. PULL UP! Welcome to the series premiere of Pull Up w/ CJ McCollum and Jordan Schultz! In this episode, CJ talks about his fifth straight playoff berth (2:00), Jordan and CJ run through the seven teams vying for five playoff spots in the Western Conference (6:00), CJ weighs in on Hassan Whiteside's remarks and Kevin Durant's newfound temper (30:00), then a reaction to Jeff Van Gundy's confusion about second cousins (37:00) and Jordan asks CJ the tough questions (38:00) about Kawhi and LeBron potentially going to Philly (?!). Then we take a trip to CJ's Wine Cellar (40:00) and get some recommendations for TV, books, and more. Subscribe to the show on Apple Podcasts or wherever you get your shows. Please rate and review the show (it helps us get the word out)! Follow us on FB/Twitter/Insta @PullUpPod. Follow CJ @CJMcCollum on FB/Twitter and @3jmccollum on Instagram. Follow Jordan @Schultz_Report on Twitter and Insta. PULL UP!!! Series launches Wednesday April 4th!